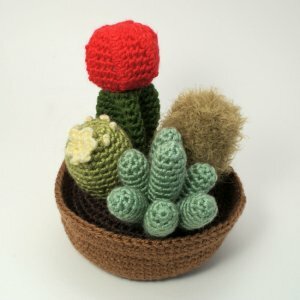 Cactus Collection 1 is an original crochet pattern by June Gilbank, including patterns for 4 different cacti: Notocactus, Moon Cactus, Echinocereus, and Mammillaria. Details: pattern is 14 pages long and includes over 30 step-by-step photographs and explanations so you can crochet perfect cacti of your own. Date Added: 02/26/2018 by Catherine J. Date Added: 09/27/2016 by Melissa J. Such fun and fast! Patterns are clear and easy to read. Date Added: 01/31/2015 by Julia R.
Date Added: 08/27/2012 by brandi e.